You are here: Home / social media / Do you get tired of asking your Pilates clients to bring a friend to your Pilates studio? Do you get tired of asking your Pilates clients to bring a friend to your Pilates studio? How did your best clients find you? Did they just drive by or was it that they heard about your studio from a friend? Well over 75% of the studio owners I talk to tell me that referrals are their best source of new clients. 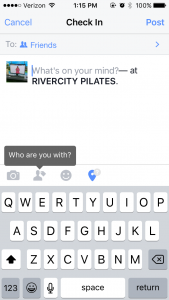 Did you know that Facebook can help you make sure those “friends” know about their friend coming to your studio? It’s called a Facebook Check-In, and it’s a pretty powerful tool if you take advantage of it. Facebook Check-ins provide all the information a potential customer would look for – your location, ratings, and a link to your Facebook page for more details. If a check-in is viewed on a mobile device, clicking the map will even bring up driving directions. Facebook Check-Ins serve as a personal referral from one friend to another. By checking in, a Facebook user is endorsing a business. And people don’t share information about a place they’ve visited unless they think their friends are interested. And the most exciting part of Facebook check-ins for you is that they are typically seen by at least 200 friends of the person checking in! The very first day we tried this at the studio where I attend classes, the very first check in was from a Rivercity Pilates staff member, and less than an hour later, there was a response from one of her friends saying that she’d been wanting to try Pilates, and asking for more information about the studio! Instant Success! As with anything in the social media world, consistency is the key to success. Your staff needs to remind people to check in. You need to be consistent with the prizes, and occasionally — you might want to give away “a big one”. People need motivation. Everyone walks into a business with their smart phone, some are texting on the way in. You just need to persuade them to check in and your business name goes out to all their friends. If that check in gets a few likes from the first folks who see it, Facebook will send it out to even more people. You can have signs and reminders around your business. 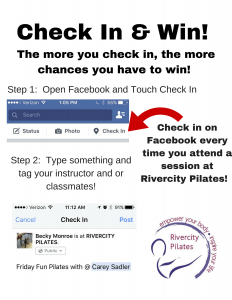 Ask your instructors to like the check-in posts that they see from people checking in to your studio. 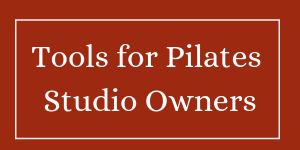 As a Pilates Studio Owner, you know that everyone has to decide when the time is right for them to start a Pilates practice. If they start seeing that their friends are going to you Pilates studio on a regular basis, that may be just the jump start they need to check out your business. Facebook check-ins can be an instant social media WIN for your business. Previous Post: « Have you been making efforts on social media that have fallen flat?